A senior Egyptian religious official said on Saturday that bearing arms during demonstrations and marches is religiously prohibited. Chaos erupted in Egypt after the security forces violently dispersed two major protest camps of supporters of deposed president Mohamed Morsi in Cairo, killing at least 200 people. Nationwide violent clashes followed, leaving a total official death toll of over 600. Further clashes on Friday left over 50 people dead. An exact estimate of deaths and injuries has yet to be announced. 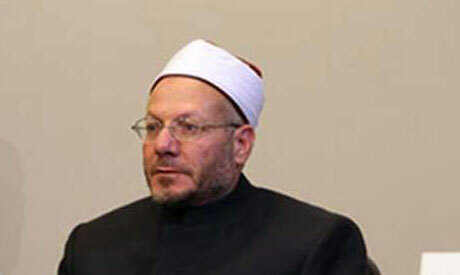 Allam further stated that he “strongly condemns” attacks on churches, warning against inciting sectarian strife. Government buildings, police stations and dozens of churches have been attacked nationwide since the eruption of violence on Wednesday. Several people amongst the protesters were reported to have been carrying arms over the past days. On Friday, Egyptian state television showed footage of two men armed with automatic weapons at a march on Cairo’s 15 May Bridge near downtown Cairo. Supporters of Mohamed Morsi have vowed to continue demonstrating every day in what they dubbed the “week of the coup’s end” referring to the military-led ouster of Mohamed Morsi on 3 July. Allam called for a “peaceful political” solution to the current crisis despite the difficulties, saying that the lives of Egyptians should be protected.